NAPA, Calif. (AP) — At last, a new face on the other side of the line. Oakland linebacker Tahir Whitehead was at the center of one after hitting a Lions player who was getting up after making a long catch near the end zone. Whitehead, who played six seasons in Detroit, including the last four as a starter, also exchanged good-natured ribbing with Lions running back Ameer Abdullah during a goal line drill near the end of practice. Detroit quarterback Matthew Stafford looked crisp while leading the Lions’ first unit. At one point he completed a deep throw to Marvin Jones Jr. for a touchdown after Jones raced past Raiders cornerback Antonio Hamilton. 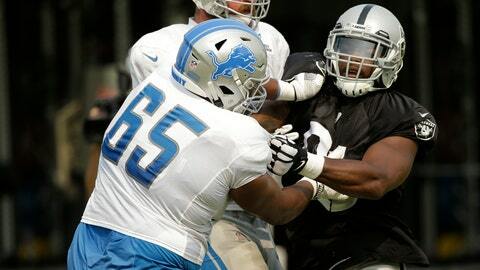 Carr was equally sharp but threw his first interception of training camp when he was picked off by Detroit’s Darius Slay. Notes: Lions defensive end Ziggy Ansah made it through his second practice after coming off the physically unable to perform list earlier in the week. “There’s certainly some different things for him that we’re going to have to learn this year to be able to do,” Patricia said. “Just getting him on the field is one step closer.” . Raiders running back Chris Warren provided the play of the day when he leveled Lions linebacker Jarrad Davis and sent the former first-round draft pick flying back.